I don’t write about my children much here, and it is probable that most of my readers don’t know I have two children who have autism-spectrum disorders. Psychological testing done by Maggie’s school indicates she has Asperger’s Syndrome, which many people describe as a high-functioning form of autism. I don’t have any evidence to support this notion, but it is my belief that Asperger’s Syndrome is a little more difficult to spot that other autism-spectrum disorders because “Aspies,” as they are commonly called in the autism community by themselves and others, can often be quite bright. I think they often are labeled as ADHD or something else. Maggie appeared to develop quite normally, perhaps even precociously. She didn’t have problems until she started school, and those problems manifest themselves mainly socially — she is often in trouble in school, and sometimes, I feel so frustrated for her because I’m not sure how much of her behavior she can control. She has resource classes language arts and math. She receives occupational therapy and speech therapy (she still has a tendency to say things like “fird” instead of “third,” for example). My son’s developmental delays are more noticeable. I can’t tell you exactly when we realized Dylan wasn’t developing at the expected rate. I attributed his slowness to talk to the fact that he is a boy — I had had two girls, and both talked when they were supposed to talk, but I had heard boys were a little slower. So, I didn’t worry. And then he was three, and I didn’t want to believe that anything could be wrong. I was in some denial for a while, and frankly, he probably could have received help a little earlier if I hadn’t been in denial. 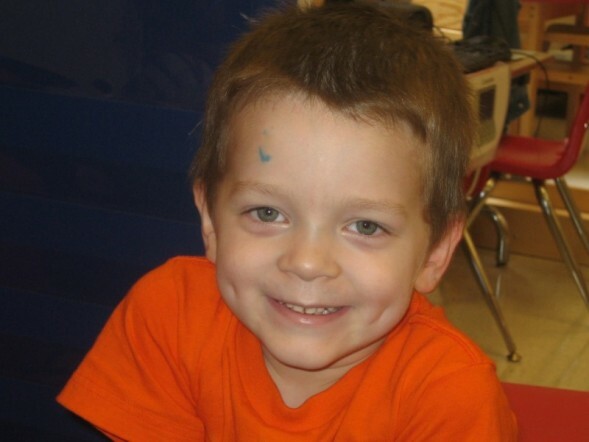 By the time he was three, as I said, we were concerned enough to seek help, but didn’t know how. I didn’t realize, for instance, that even though he was technically too young for pre-K, he might have been able to be placed in a special needs pre-K class because of his developmental delays. We didn’t consider autism a possibility at first because Dylan is a very affectionate child. He does not have a flat affect, and he isn’t fixated on only one kind of food — he eats pretty much whatever. One thing I have learned about autism, though, is that autism doesn’t look one way. If media coverage has done autistics and their families one disservice in particular, it is perpetuating a notion that autistics are all like Rainman — “idiot savants” who are otherwise intellectually disabled and can barely stand to be touched. To be honest, Dylan has not been diagnosed in any official way. He qualifies for special education services through “pervasive developmental delay,” a conclusion reached after he was tested last summer. I do want to firm up the diagnosis, but all of Dylan’s teachers and doctors have said autism is the most likely diagnosis. Dylan just has not had the official testing done. Before Dylan started school, he had maybe three words. His speech therapist said she thought he just didn’t understand the power of language because we met his demands when he made nonverbal requests. We began using a bit of sign language with him. I wanted so badly to believe that she was right — that he was just deciding not to talk because he didn’t have to. In my heart, I always knew that she was wrong. There was something more complicated than choice involved. 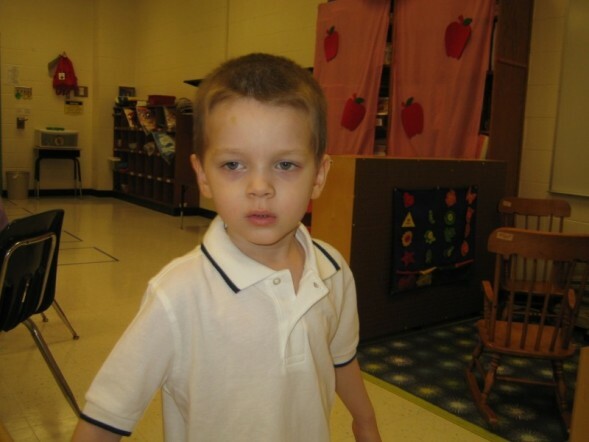 Dylan is now in a special needs pre-K. As I type this, tears well in my eyes because… it’s just been so remarkable. He talks all the time now. New words all the time. He is going through that parroting stage that kids usually go through when they learn to talk at about eighteen months. Only he is going to turn five next month. He actually learned to write before he learned to talk. We realized it when he had arranged his letter puzzle pieces to form the word “Jetix.” Jetix is a block of programming on Toon Disney. It’s geared toward boys with shows like Power Rangers and a cartoon Dylan loves called Pucca. I saw the puzzle pieces arranged to form “Jetix,” and I will never forget it because 1) it couldn’t have been accidental, and 2) it was a logo on the bottom of the screen on the Jetix program block, and I knew Dylan had been exposed to the word. I showed my husband what Dylan had done, and we took pictures of it. We sent them to the teacher who evaluated him for special education, and she found them very interesting. I remember we pointed to what Dylan had “written” and said the word “Jetix” aloud, and he was clearly thrilled. He had managed to communicate, and we had managed to understand. A whole new world opened up to him, and the way I describe it is that Dylan sort of unlocked. He taught himself to read and write. Yes, really. My mother gave him a Doodle Pro drawing pad, which is like a Magna Doodle — you draw the words using a magnetic pen on a type of slate, and these little iron filings are attracted to the pen and rise to just under the surface of the slate, forming pictures. He began learning words left and right, writing them on his Doodle Pro, and showing them to us to hear us read them. When he started school, we bought him an extra one to keep at school. He still uses it to communicate, but he has learned to be more verbal through speech therapy. In many ways, I am finally getting to know my son as he learns to communicate his ideas and feelings. I can’t imagine the frustration he must have felt over not being able to tell us his wants and needs. Just now, as we sat together and looked at this picture, Dylan was able to tell me three things about it: 1) it’s a picture of Dylan, 2) his shirt is orange, 3) he is happy in the picture. I think Maggie has a tougher time in school. Because Aspies appear to be so much more, well, normal, they are expected to act normal. If Dylan engages in autistic behaviors in class, his teachers deal with it on a completely different level than Maggie’s do — even her resource teacher. It’s tough, I know, because she infuriates me. And then I have to tell myself — stop, think about it. Like I said, even I’m not sure how much she can control her actions. Dylan’s self-contained classroom offers him the support he needs, but if Maggie does not need to be in a self-contained class, I don’t want her to be. I support the IDEA’s notion that she is entitled to learn in the least restrictive environment possible. Looking around online today, I rediscovered a website, including an autism blog, belonging to a former student of mine. He was, as I recall, misdiagnosed with ADHD. I understand that he wasn’t recognized as autistic (he has Asperger’s) until he was a senior in high school, two years after I taught him. He has a lot to say about how he perceives things and about his experiences. I find it fascinating to read on two levels. First, as the parent of two ASD children, I often wonder what they will face as adults — what will they be like? What will they be able to do? While no two ASD people are alike, and my children are likely to be nothing like Cody, I do feel like I have a window, of sorts, into what it is like to be an adult with autism. Second, I am fascinated by the person he has become. He was already an excellent writer and thinker in 10th grade. I cannot take credit for teaching him to write well, as I inherited him as a student with those skills already in place. He is one of those students you never forget, and not because of any ASD-related reasons. He was just such an excellent student. I don’t think I will ever read The Crucible without thinking of Cody’s reading the part of John Proctor. Cody has some very interesting points on his blog, including the idea that autism should not be viewed as a disease we need to cure, but as a different way of being. He’s articulate, and he knows himself. I can only hope my own children will be able to discover who they are and feel comfortable in their own skin the way Cody seems to be. I know that was a hard battle for him, and maybe it isn’t over, but I also know he has support, which is another thing my kids can count on. I've had a n Asperger's student in class. I teach High School English. There is a presumption by the 11th grade that students can do basic grammar without coaching. I wrote something on his paper about verb tense error. He asked what that was. I showed him his paper, then a corrected version. He stood up in class and told me "If I can't understand it, you're not a very good teacher". I was a bit taken aback by his comment. I'd been told by our resource folks to expect outbursts. While it was not the type of outburst I expected from a 17-year-old, it did teach me something I should have known; not everyone CAN handle what I consider basic grammar (basic to me ain't basic to them), and I need to be prepared to "teach" the basics. His approach might not have been age-appropriate, but he was correct. Luckily I had some foreknowledge of what to expect; my response might not have been helpful if I thought he was being disrespectful. Make sure your daughter's teachers and other professionals know all about her condition; what to expect and how to handle it. Tell them what you want done: do you want a call when things like this happen? A referral to the resource department. Don't count on the school to keep the teachers up-to-date. I was lucky in this case, but I've hear horror stories from other teachers. Don't forget to be an advocate for her. Dana, thank you for sharing this. I can relate on so many levels–first, as a person with a disability and second, as someone who knows what my parents went through as they tried to figure out why I wasn't progressing as fast as my older sisters. Doctors told them I was retarded, slow or hyperactive until my deafness was diagnosed at age 2.5. Like Dylan, I didn't have much language–10 words by the time I was diagnosed, with only 5 of them intelligible. My mother has a recording of me speaking, I think, when I started speech therapy and it makes her weepy, too. I also relate to Maggie enormously! In terms of appearing to be so normal, and having to live up to the expectations of that– I had to advocate for myself at an early age because of those expectations and misunderstandings about my disability versus my intelligence (somehow, one precludes the other, for many people!). Even today, I still deal with this because it's hard for people to believe that I'm deafer than I appear to be–I have YEARS of speech therapy , an excellent education (both sp.ed. and mainstream) and extremely supportive parents to thank for that. It's amazing how, despite the enormous differences in developmental delays and physical disabilities, the manifestations are similar, in terms of social behavior, and educational delays/setbacks. [newbie] It is no longer surprising to me, to find so many of us who have more than one child on the spectrum. Initially I thought I was the only person on the planet with more than one, but through their school and the blogosphere, I've come to find that we are far from the minority. I've enjoyed reading about your children, maybe you'll write about them again? What tremendous people you and the folks surrounding your children must be. And Dylan's two pictures are stunning. He looks like a different child in the second one. As a parent of a son with Autism, and Aspberger's at that, I can honestly say that I pretty much agree with your thoughts on this. My son is now 18 years old and over the course of the years I too have seen what I suspect to be the frequent misdiagnosis of ADHD and such. I particularly love your comment about "Rainman" and the stereotypical assumption that these individuals are all the "idiot savant type." I too have grown weary of it, as has my son. People are all too quick to think they know it all and never take the time to realize just what a variety of talent these so-called disabled individuals have. My son too has been and still is very affectionate although he wasn't always. I'd like to hear more of your experiences and observations. Thank you for sharing so personally of autism in your life. Your children are fortunate to have you to advocate, support and love them. I'd love to invite you to an online community I founded to reach out to families (like my own) who have a child on the spectrum. I find it very interesting how many of us have more than one child affected with issues in one way or another. I'd love to have your perspective and presence. Hi, how nice to get views on your experiences with Asperger's as well as how they are being responded to at school! It is so true that kids with Asperger's have a tougher time because they appear mostly "normal", but then they still need certain accomodations. As a parent of an Aspie and married to an Aspie I have been fighting for my child's rights in school to an equal education, yet many of his teachers seem to think he is just fine and they don't need to do anything different. It is hard when he is so smart and yet there are still all those things that make him have a hard time to learn or process things. As being married to my husband who wasn't diagnosed until after we were married, he tells me of his nightmare experience in school and at home because his teachers and parents didn't see him as different, but rather lazy and dumb. I look forward to reading more of your experiences. Thank you.